One of the questions that we get asked quite regularly in regards to proxy service providers is whether or not GhostProxies is a scam company who want nothing more than to take your money and run. It seems that every day, an unsuspecting newbie will come across an extremely negative review of this company (of which 99% are fake reviews generated by competitors) and start believing that they are illegitimate and a “scam”. First of all, who is GhostProxies? GhostProxies is one of the most popular and well-respected proxy providers on the internet, with a loyal and sizable customer base. In business, companies are popular for a reason. Scam companies and companies who provide poor customer service do not last long, and they certainly do not maintain the level of devoted customers that GhostProxies have over the past 5 or 6 years. Anyway, to prove to myself (and our readers) that GhostProxies is a legitimate service provider, we decided to purchase some proxies for ourselves, reviewing the entire process from start to finish. The first thing that we realised when we were scouring the GhostProxies website on our pursuit for some new proxies was that they are competitively priced for such a ‘prestigious’ and well-respected brand. Typically, popular service providers will inflate their prices because, well, they can do so and still maintain the same customer base as before because they are trusted and respected. 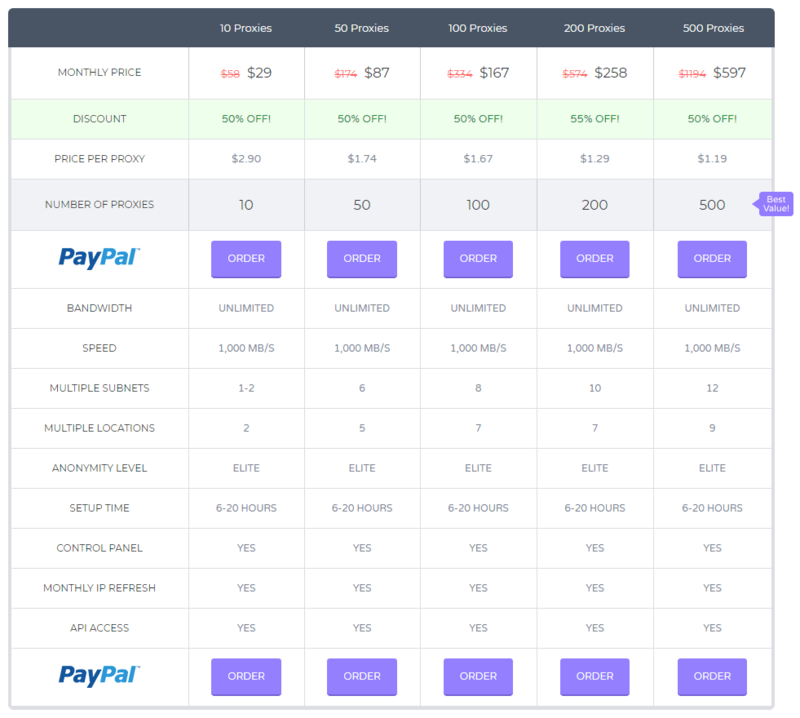 For the smallest bundle (10, I think it was), the price per proxy was around $2.90, but as with most proxy providers, they use a tiered pricing structure so the more you purchase, the cheaper they get. If you were to purchase several thousands of proxies, you could bag them for as low as $1.19 each, which is fantastic for such high calibre proxies. Surprisingly, even in 2019, a lot of the big name proxy providers are still selling proxies with a bandwidth cap, which to us simply doesn’t make sense. Any serious marketer worth his salt will be much more likely to purchase a proxy if it was offered with unmetered bandwidth, but still, not many services are offering this luxury. Luckily, all GhostProxies are unmetered, meaning you can use them as aggressively as you need to use them in your campaigns without them being shut down or your account cancelled by your service provider. Not bad for proxies at this price. Also, the speeds are fantastic. All of GhostProxies virgin proxies are on 1000MB/s lines, so they are stupidly fast. If you have never used proxies on a Gigabit line before, you will be in for a treat with these. One thing that we hate when purchasing new proxies is the constant back and forth and juggling support tickets just to get an answer to a simple question. GhostProxies provide a simple email support system, where you are actually speaking to a real representative who know what they are talking about. The company is based in the USA, so the support lines are the busiest throughout the day, but we still managed to get a response within 24 hours, which was great. We were promised a manual set up of our proxies within 48 hours, which we were already fine with in the first place as the setup of real proxies does tend to take a lot longer than the cheaper, instant proxies that you can find online. With that being said, we were surprised to see that the set confirmation email was in our inbox the same day, and everything was ready to roll from then onwards. What a way to over deliver on their promises! So, after all has been said and done, do we believe that GhostProxies.com is a scam company who have built their empire on stolen money? GhostProxies is possibly the best service provider that we have ever used, and we will happily use them again in the future. The setup was fast, the proxies are unmetered and run extremely fast, the support was responsive and helpful and their prices are a steal for the quality. Hopefully this review has answered any questions may have had about them. Let us know what you think!